Set of 4 drink coasters on Italian marble. Featuring our favorite sea creatures on coasters. Our Italian marble coaster sets are the perfect gift for the person who has everything. Our drink coasters are impressive, top quality and truly unique. Shop our unique assortment of marble coasters and glass coaster sets. 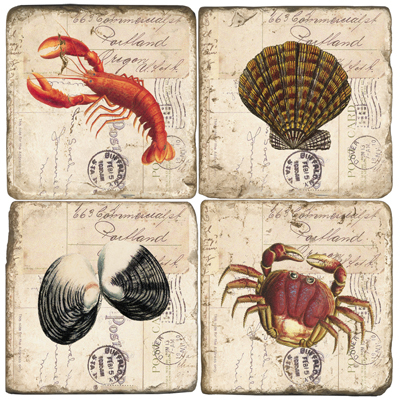 Our coastal coasters are made of Italian Botticino Marble, quarried in Verona, Italy. Do the coasters absorb moisture?